The Cambridge International AS & A Level Economics Revision Guide helps students apply their knowledge, understanding and skills to succeed in their course. This endorsed Cambridge International AS and A Level Economics Revision Guide has been designed to further develop students’ skills for their Cambridge International AS and A Level Economics course. Revised to meet the latest syllabus (9708) this book is packed full of guidance to reinforce students’ understanding and skills to succeed in their course. 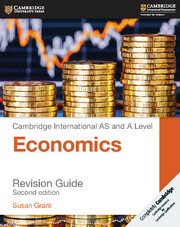 Written in a clear style by an experienced examiner this Revision Guide is perfect for international learners and accompanies the Cambridge International AS and A Level Economics Coursebook (third edition). Explains important subject content, concepts and techniques step-by-step to help students consolidate their learning. Activities throughout to check progress with the answers at the end of the book. Key terms to highlight definitions of economics terminology for quick reference. Includes tips for successful revision techniques to help students avoid common pitfalls.